Wisconsin manufacturers say they have high-paying jobs ready and waiting for young people after they graduate from high schools and tech colleges. 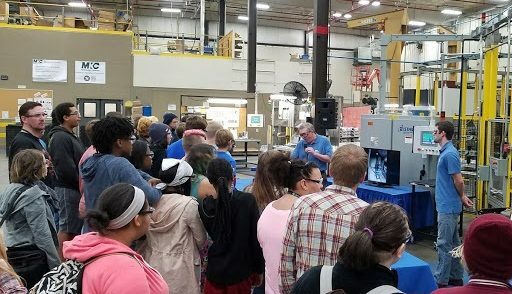 Hundreds of students came to Madison-Kipp Corporation in Sun Prairie on Oct. 7 as part of a Wisconsin Manufacturing Month kick-off event to learn about future job opportunities. During the tour, students from Madison, Stoughton, and Oregon learned about more than 30 types of jobs that include robotics, programming, and engineering. MKC manaufactures precision machined component parts for companies like Harley-Davidson, Kohler Engines, and more. MKC’s President/CEO Tony Koblinski said manufacturing today is driven by technology, and showing that to kids can make a future career in the industry more appealing. “A manufacturing career is different today than it was years ago before it was all about the hands, now it is much more about the mind,” Koblinski said. Koblinski said as baby boomers get ready to retire from the manufacturing industry, the move is on to attract young people to fill jobs. “We have to capture the kids early in terms of thinking of a career in manufacturing and through the partnerships that are going on between the agencies, schools, and manufacturers we are creating opportunities to intern, youth apprenticeship for when [they leave] high school,” Koblinski said. The manufacturing industry also offers good-paying jobs. The average manufacturing worker earns $55,000 per year, 22 percent more per year than other private-sector workers, and that state’s manufacturing industry employes more than 465,000 employees. Ray Allen, Wisconsin Department of Workforce Development (DWD) secretary said the agency is partnering with colleges, tech schools, and businesses to offer internships and training for youth that are interested in a manufacturing career.